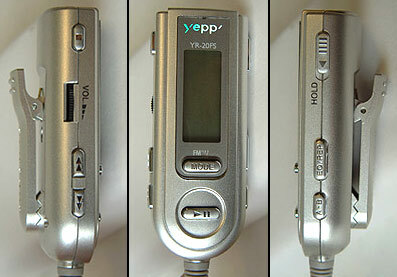 Abstract: Additionally, the "mode" button on the remote let's you switch the YP-700H MP3 player over to a digital FM tuner. 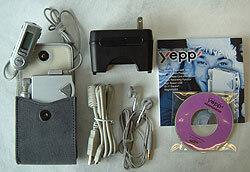 The Yepp YP-700H MP3 player; smallish, aluminum encased, and packing an FM-tuner. 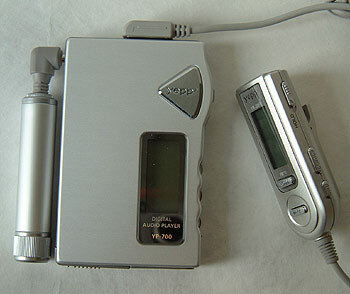 With portable MP3 players, the one thing often overlooked by consumers is size. Don't get me wrong, features like storage space, removable media support, battery life and the design are important. It's just that how you ultimately use an MP3 player should somehow factor in. 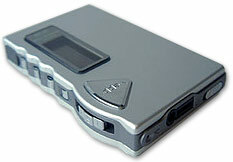 Speaking from experience, the smaller MP3 players inevitably get carried around more, and that is something which grins in the face of this tape cassette sized unit. Samsung's Industrial Design team haven't been in the dark on this notion, and so to make it easier for us to pack away the YP-700H in bags, knapsacks and jacket pockets they have added a remote and nice long cable. Protecting the soft aluminum exterior is belt case made from real suede leather which adds a touch of class too. There is space inside this case for both the YP-700H and its external, secondary AAA battery back-pack, but I'm not sure how "pocket friendly" this makes the player. Once encapsulated in the suede cover the controls are unreachable, and so the YP-700H remote control becomes a life saver. The remote measures about 1.5cm x 6.5cm x 2.5cm and although I wish the sping clip had a stronger grip than it does, everything else is where it ought to be, or easy enough to figure out without directly looking at the device. Proof positive that the controls are fairly intuitive. A blue back lit LCD display illuminates with the changes keyed in on both the main player, and the remote a la Indiglo. Additionally, the "mode" button on the remote let's you switch the YP-700H MP3 player over to a digital FM tuner so you can listen to the radio. Sorry, AM is not included. After listening to YP-700H radio for a while, I can say that the quality of the FM signal doesn't seem quite as good with the old ferrite core Walkman's, but it's still entirely listenable. Behind the YP-700H's sly Indiglo display, and aluminum skeleton, rests 128MB of built in memory. To keep the music going even longer, this MP3 player also packs in a 1mm thin, Smart Media flash memory slot for extra storage. Smart Media memory (3.3V type) is used by digital cameras predominantly, and comes in 16MB, 32MB, 64MB, and 128MB (about $48USD) flavours. SmartMedia (SSFDC) itself is a very thing package, about 1mm thick, and houses a single NAND flash EEPROM. Write speeds typically sit around 1.2MB/s, and read speeds at 10MB/s. With a 128MB SmartMedia card installed (this does not come with the unit by the way) the total MP3 storage of the YP-700H balloons to 256MB. This is still many Gigs shy of what a hard drive based MP3 player can store, but for solid-state flashed based players this is at the top of its class (and quite smaller to boot).